Powers/Abilities: Siege's biological parts were in a semi-decomposed state and his digestive system only allowed Siege to absorb a liquid nutrient formula. Due to the lobotomy of the cyborg's brain Kelly's memories had been uploaded to Siege was unable to feel any tactile sensations. Because his personality had been encoded to the cyborg in machine language Siege was immune to mental scans. Siege's woven metal-mesh body suit was of considerable durability, was capable of flight and enabled Siege to lift up to 100 tons. Due to Kelly's year-long training in the military and police forces Siege was an excellent hand-to-hand combatant. Aside from that Siege's cyborg body possessed a built-in Gattling assembly on his right forearm capable of discharging 100 low-yield plasma bursts per second. His right forearm contained a built-in plasma cannon capable of significantly more powerful discharges. Siege's built-in database was capable of a myriad of functions, including long-range surveillance and tracking systems and self-diagnostic and repair functions. Upon joining the Initiative's Command ARMOR protocols were uploaded to his database. He was also equipped with a large gun as a member of the Command. Kelly never learned how to fully access all of his body's abilities. (Deathlok II#17 (fb) ) - John Kelly was a soldier in the Vietnam War (topical) until he was called back to the United States where he was treated without respect by the American citizens. After the war Kelly became a cop in the South Bronx and went after some of the craziest criminals out there. Internal affairs didn't approve his methods and tried to get him fired on a weekly basis. Eventually John's wife left him with their daughter because she thought he was dangerous. Some time later Harlan Ryker recruited John for his cyborg super-soldier program. After being shown the Deathlok cyborg Kelly happily agreed to be part of the project. (Marvel Comics Presents I#62 (fb)/Deathlok II#14 (fb) ) - Colonel John Kelly volunteered to have his brain transplanted into Cybertek's new Deathlok cyborg. (Marvel Comics Presents I#62) - In Paterson, New Jersey Cybertek tested Deathlok's skills against some hired mercenaries. Kelly loaded his mission programming disk and started the mission. He easily took out several mercenaries before the computer controlling the cyborg decided that Kelly's brain was an error when he tried to resist the computer's commands. It corrected this error by electrocuting and killing Kelly's brain. (Deathlok II#14 (fb) - BTS) - A complete back-up of Kelly's memories was stored in the Deathlok cyborg's new brain's subconscious. (Deathlok II#9-10 - BTS) - When Michael Collins was trapped in Nightmare's realm his subconscious took control over the Deathlok cyborg and spoke with John Kelly's voice when Deathlok's computer ran a nightmare as program. Colllins ultimately regained control over the Deathlok cyborg. (Deathlok II#17) - When Deathlok (Collins) accessed the memories of John Kelly he accidentally released Kelly from his subconscious turning him into an artificial intelligence within the Deathlok cyborg. 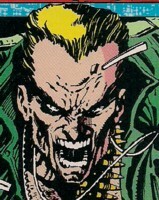 Kelly answered Collins any question he had on Kelly's past up until his brain was electrocuted by Deathlok's computer. When Kelly was done talking to Collins the computer couldn't shut him down anymore and stayed as the voice of anger in Deathlok's head. When Deathlok went to Roxxon's Clayton Burr to learn the whereabouts of his human body Kelly's voice kept telling him to hurt Burr because he wasn't telling them everything. Kelly decided to keep the Deathlok cyborg after Collins returned into his own body. Deathlok later flew to Paris, France to get his body. (Deathlok II#18) - Kelly kept telling Deathlok to kill their enemies while the Deathlok fought members of ULTIMATUM. When Silver Sable and the Wild Pack arrived to help them Kelly was pleased by their violent natures. When Deathlok, Silver Sable and the Wild Pack found Cybertek's lab in Paris Kelly was angered at Deathlok's lack of self preservation and mocked him while Ben Jacobs and Cyberwarriors beat him up. (Deathlok II#19) - Kelly's consciousness fled into one of the Cyberwarriors when Deathlok connected himself to the Cyberwarrior to override Mainframe's control over it. With Kelly in control of the Cyberwarrior he violently fought the other Cyberwarriors. Unfortunately for Kelly he was just controlling the cyborg and couldn't feel anything. Cybertek's agents Jacobs and Mainframe eventually fled the scene leaving Deathlok, Siege (Kelly's new name), Silver Sable and the Wild Pack behind to drown in the waters of the River Seine. Siege followed Mainframe and Jacobs and took Deathlok with him. Jacobs and Mainframe escaped them by teleporting away. Siege was ready to continued the fight against Cybertek and didn't want to surrender the Cyberwarrior body anymore. Deathlok threatened to kill him. (Deathlok II#20) - Deathlok couldn't kill Siege and Nick Fury wanted to take Siege to SHIELD to analyse him. Siege was knocked out with sonic neural disruptors, but Siege was able to reroute the energy and was buried under the collapsing lab after fighting off Deathlok and SHIELD. Siege survived, dug himself out of the rubble and tracked down the other Cyberwarriors with his onboard computer finding them and Cybertek's top agents at their Cyberbase in Paris. He was soon joined in his fight by Deathlok and Coldblood. When Siege decided to kill Ryker, Deathlok stopped him because Ryker had activated a bomb that would kill them all if he didn't get out alive. (Deathlok II#21) - With Deathlok in his way Siege couldn't kill Ryker, but he was sure Ryker would let them die anyway. 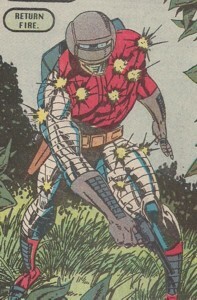 Deathlok fought Siege for the life of Ryker, who was teleported away by Jacobs during their fight. Siege, Deathlok and Coldblood then worked together to deactivate the primary charge--a nuclear bomb. Siege and the others then left the base while Deathlok tried to save his human body. Siege helped Deathlok and Coldblood track down the Cyberwarriors again and attacked them in Kuwait. Strangely Siege could remember the Gulf War despite not even being alive at that point. He discerned that these were leftover memories from Collins. 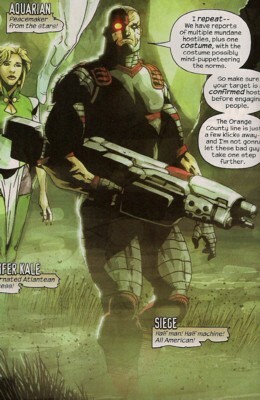 Ryker was caught by Deathlok and SHIELD and Siege. Siege, not giving in to Fury's request to give SHIELD a chance to analyse him, left to go after another Cyberwarriors shipment. (Silver Sable and the Wild Pack#11) - Siege went after the Cyberwarriors that were sold to the Genesis Coalition. Tapping into an Avengers distress call enabled him to discern the area the Cyberwarriors would soon be. (Silver Sable and the Wild Pack#12) - Siege attacked the Genesis Coalition's Cyberwarriors at Mount Wundagore and destroyed them with the help of the Knights of Wundagore, Silver Sable, her Wild Pack and the Next Wave. (Deathlok Annual#2) - Siege returned to Iraq to help the US Air Force against Iraqi jets. He destroyed all enemies and then saved the life of his old friend Danny, who had been one of the pilots shot down by the Iraqi troops. After taking down several Iraqi ground forces including tanks and infantry Siege was ready to bring Danny to safety. (Deathlok II#27) - Siege fought Timestream's Bangers in Australia near Mount Kosciusko. Misty Knight informed Deathlok about the incident and Deathlok flew to Australia. When Deathlok arrived Siege had already gotten into trouble with the Royal Australian Air Force. Deathlok tackled Siege with his ship before Siege could destroy any of the RAAF's jets. The Bangers attacked them both and Siege and Deathlok now worked together against them. They broke into Timestream's base, but Deathlok stopped Siege from killing Timestream, who caught both cyborgs in a stasis field. (Deathlok II#28) - Siege and Deathlok were kept in stasis while Timestream told them that he was going to conquer Australia. Siege was able to set them both loose by rerouting the energy used to keep them in stasis. Siege revealed to Deathlok that he remembered everything that Deathlok did while Kelly's mind was stored in Deathlok's subconscious. Siege and Deathlok fought against Timestream, but he was soon aided by the Bangers. Siege fought them alone while Deathlok tried to deactivate Timestream's doomsday weapon. Due to their forcefields Siege couldn't kill any of the Bangers. After the weapon was deactivated Timestream teleported away. Deathlok apologized for his misjudgement of Siege afterwards. Suddenly the Goddess' sacred flame appeared and consumed Siege and Deathlok. (Deathlok II#29) - Siege's seeming destruction was stopped/reversed (when the Goddess was caught by Thanos & Professor X in Infinity Crusade#6). (Daredevil I#321) - Nick Fury hired Siege to find John Garrett and find out if there was a connection between Garrett's kidnapping and the Hand's recent attack on the Pentagon. Siege took the job. (Daredevil I#322) - Siege overheard Daredevil and Eddie Passim talk about the About Face virus. Siege thought about taking the virus to feel again. Siege surprised the Snakeroot when they approached Passim and asked them to take him to the virus and Garrett. A fight broke out and Siege fought the Snakeroot alongside Daredevil until Elektra arrived. Siege then turned on Daredevil because he was interfering with Siege's mission. (Daredevil I#323) - Siege dropped in front of the truck with the Snakeroot ninjas on it and it exploded after it ran into him. Siege caught Bisento, who had offered Daredevil to help him find Passim. Venom (Brock) entered the fray and abducted Bisento, escaping the heroes despite Siege's firepower and Daredevil's quickness. They soon caught up with Venom and Bisento, but Daredevil told Siege that they wanted to talk this out instead of killing Venom. Stone of the Chaste suddenly appeared and killed Bisento in front of Siege, Daredevil and Venom. (Daredevil I#325) - Siege was still after Garrett and wound up on a ship just off Staten Island where Garrett had been killing several people alongside Erynys. Some time later Siege helped Daredevil and Elektra drive off the Snakeroot. (Deathlok II#31) - Deathlok and Siege defeated Scorpion (Gargan), who tried to hijack a ship with Italian sportscars. In Coney Island they were later approached by Godwulf from Earth-7484, who told them that Timestream planned to destroy reality-616. Godwulf showed them in cyberspace the history of Deathlok the Demolisher. (Deathlok II#32) - Godwulf transported Siege and Deathlok into Earth-616's past to stop Timestream, Deathlok the Demolisher and the Bangers from destroying reality by killing Captain America (Rogers). The trio stopped the scheme when Siege saved Captain America, but Timestream escaped once again. Siege was then sent out to delay Timestream from reaching the younger Godwulf in the subway station where he would meet with a younger Deathlok the Demolisher. Siege attacked Timestream and the Bangers, but the Demolisher easily defeated him. After the younger Godwulf was saved the older Godwulf teleported everyone including himself, Deathlok (Collins) and Siege into the timestream. (Deathlok II#33) - A comatose Siege and his allies Godwulf and Deathlok were found by Justice Peace within the timestream. 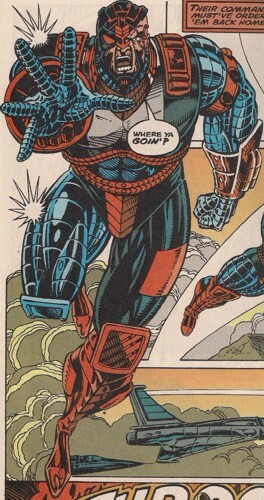 While Godwulf was beat up by Peace and his fellow timecops, Deathlok tried to reach Kelly's mind within Siege, who eventually regained consciousness and fought off the timecops. Godwulf, Siege and Deathlok stole Justice Peace's craft to hunt down Timestream and his men. Siege attacked the Bangers once again, saved Godwulf and then followed Timestream and the Bangers into another timeline. (Deathlok II#34) - Arriving in the past of Earth-7484 Siege and Godwulf protected Henry Akai from his future self Timestream and the Bangers. After Timestream had been destroyed, Siege and Deathlok (Collins) were sent back to their timeline by Justice Peace. Siege, Deathlok (Collins) and Justice Peace later visited the grave of Luther Manning, who had been used by Timestream in his recent scheme and died during it. (Daredevil I#330) - Nick Fury had Garrett reactivated as an agent of SHIELD under his command, and sent Siege to watch over him and make sure he towed the line. (Civil War: Battle Damage Report) - Tony Stark considered Siege as a potentioal Initiative recruit. (Marvel Zombies 3#1 (fb) - BTS) - Siege registered with the Superhuman Registration Act and became part of Florida's Initiative team the Command. (Marvel Zombies 3#1) - Along with the rest of the Command Siege was sent to the Citrusville Swamp by ARMOR to deal with the zombified Deadpool from Earth-2149 (Marvel Zombies Earth) and those that had been turned into zombies by him. Siege was bitten in the face by a zombie when he didn't realize at first what their enemy actually was. Jennifer Kale killed the female zombie, but Siege was already infected with the virus and became a zombie himself. He crawled after Jennifer Kale, but before he could satiate his hunger on her, his biological parts were destroyed by his cyborg parts according to ARMOR quarantine protocol 12(B). With its humanoid parts gone the cyborg's computer sent out a distress call to ARMOR. Comments: Created by Dwayne McDuffie, Gregory Wright, Jackson Guice, Mike Manley, Walter McDaniel & Jimmy Palmiotti. It might be worth noting that since John Kelly survived as a digital back-up of his brain the first time his organic bits got fried, there's no reason to believe he couldn't be resurrected again the same way. The mechanical bit wasn't affected by the virus, and it's not unreasonable to believe his computer was making regular back-ups of Kelly's memories and personality, and so would have a copy of him prior to virus infection.